In the spirit of doing completely random things, I am going to post the card game I invented in the late nineties, because I spent all of my blogging time cleaning out my closet. And yes, having a bunch of junk from the nineties is why I had to clean out my closet. Give it a try and tell me if you like it. Number of Players – Two to four. (Best with three or four.) Each plays for himself or herself. Rank of Cards – Joker (high), K, Q, J, 10, 9, 8, 7, 6, 5, 4, 3, 2, Ace (low). See below. The Draw – Draw or Cut; low deals first. Thereafter deal passes to the left. The Shuffle and Cut – Any player may shuffle, dealer last. The player at the dealer’s right cuts. The Deal – Cards are dealt one at a time to the left. With two players, each receives thirteen cards; with three each receives ten cards; with four each receives seven cards. The remainder of the pack is placed face down on the table to form the stock. Object of the Game – To be the first to play all cards in hand or collect the contracted number of points. The Play – Eldest hand makes the opening lead on each deal which must be the lowest ranked non-heart ♥ held in the hand. Subsequent leads may be any rank or suit. The card is placed next to the stock to form the discard pile. Each hand must build up in rank in the same suit or play a heart ♥ of equal or greater rank as the last card played; thus if ♣3 is played, the next player must play ♣4 or greater or ♥3 or greater. Once the suit is changed to hearts it remains so until the end of the trick. If a player holds a sequence of two or more cards in the same suit, they may all be played in one turn. For example, if the last card played was ♠6, the next player could play ♠8, ♠9, ♠10. The Joker is the trump card and can only be beaten by the other Joker. It may be played at any time and on any suit. 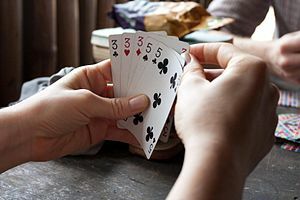 A Joker may also be used to replace a missing card from a sequence, but it then takes the value of the missing card and the trick continues. A player may opt not to play any card, even if able to do so. If unable or unwilling to play a card, the player must draw one card from the stock. If still unable or unwilling, the player must pass. Once the stock is exhausted, there is no reshuffle; the player only loses a turn. When play is blocked (no one can play), the best card wins the trick and leads to the next. The winner is the first player to go out, unless playing for points. After one player has gone out, all other players must subtract the value of their cards from their score. Jokers are 25 points each, face cards 10 points each, aces are 1 point each, and every other card is its pip value. The points for any heart cards are doubled.